'The American Dream' is a 30 minute animated film that shows you how we've been scammed by the most basic elements of our government system. 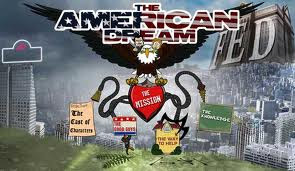 All Americans strive for the American Dream, and this film shows you why the American dream is getting farther and farther away. Do you know how your money is created? Or how banking works? Why did housing prices skyrocket and then plunge? Do you really know what the Federal Reserve System is and how it affects you every single day? The American Dream takes an entertaining but hard hitting look at how the problems we have today are nothing new, and why leaders throughout our history have warned us and fought against the current type of financial system we have in America today. You will be challenged to investigate some very entrenched and powerful institutions in this nation, and hopefully encouraged to help get our nation back on track. Are Humans Designed To Eat Meat ? Money Masters : International Bankers Who Control America !